"Describe a meaningful experience in your life. Reflect on how that experience influenced your personal growth, such as your attitudes or perceptions." This prompt allows applicants a much greater amount of flexibility in writing their statement. However this flexibility may make it more difficult for applicants to choose the right experience to define their story. Here is one way to identify your topic for the PTCAS personal statement. Start by identifying the meaningful experience. An obvious choice would be to choose a PT experience that motivated you to pursue the profession. However, the prompt does not specify that this needs to be clinical or PT-related, so don’t limit yourself to these types of experiences. Once you have a few potential experiences, you will also need to identify how the experience “influenced your personal growth, such as attitudes and perceptions.” If you cannot identify the change in your personal growth, then this experience should be ruled out. Maybe you worked with someone you disagreed with, but you learned to understand and accept a different perspective. Perhaps your experience as a caretaker helped you appreciate the difficulty of everyday tasks for someone with a chronic illness or disability. Or maybe your work with underserved communities helped you understand healthcare disparities and has motivated you to provide care in these communities. 3. How Does this Experience Affect You as a Future Physical Therapist? One key point to remember is that you’re applying to physical therapy schools with this essay. Therefore, you ultimately want to bring this response full circle and address how this change in perspective equips or motivates you to become an excellent physical therapist. Did this experience influence some of your professional goals? How has your change in perspective influenced the way you will approach patient care? Does any of your response relate to the APTA Core Values? As you plan for this prompt, you should think each experience through from steps 1-3 before you choose the actual experience. You might even want to write some quick sketches to help get you started on your personal statement before you definitively choose an experience. Take advantage of the flexibility of this prompt. Don’t worry about selecting that one-of-a-kind experience, but rather write about an event that defines your story. What do you plan to write about for this prompt? Where are you feeling stuck? Let me know below in the comments! Do you need help with your PTCAS personal statement? Contact me directly in the form below! Thank you for your inquiry! I’ll be in contact with you shortly! Many Doctor of Physical Therapy (DPT) programs highly recommend applicants to gain inpatient PT volunteer or work experience in order to be considered to competitive for admission. This makes sense because the PT profession is very broad and most DPT programs want to be sure that applicants have a wider understanding of the profession. 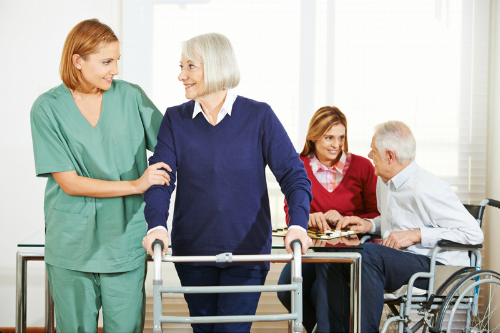 Instead of simply volunteering or working as an aide in an outpatient physical therapy setting for hundreds, if not thousands of hours, applicants should also strive to find inpatient experience. An inpatient setting basically means that the patients stay in the facility for at least 24 hours. When I learned about this type of setting as a former applicant, I immediately was thinking that I needed to volunteer in an acute care hospital setting. The inpatient PT department is full, but we can put you on the waitlist (never heard back). We require volunteers to commit to 100-300 hours of floater duties (greeting people at the door, transporting patients, administrative duties) prior to having a chance to apply for a clinical volunteer position. 1. Value your time when searching for observation experiences. Don't commit to volunteering for a hospital for 100+ hours performing floater duties before having an opportunity to shadow in your desired clinical setting (and definitely DO NO PAY to have an opportunity to volunteer--remember that you're giving your time freely). 2. Find the low hanging fruit of clinical experiences--don't only search for acute care hospital settings. Hospitals can be very bureaucratic with lengthy requirements (physicals, vaccinations, volunteer training, 1+ year commitments). 3. 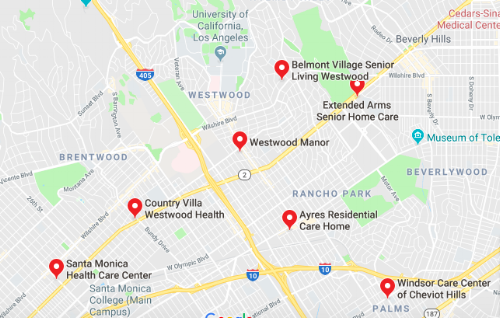 Search for skilled nursing facility (SNF) experiences. These facilities are classified as inpatient experiences and they can be easier and more flexible for volunteers. When I was a student, I found a SNF near my university that only required me to watch a 20 minute video about elder abuse and then I was given my badge. A quick Google search showed the SNF locations in the screenshot below, which are all a 5-10 minute commutes from my former university. I would likely bet that most of these facilities have 0 volunteers or aides (because applicants hardly ever think to search for these places!). I currently work as a PT for a SNF and just this week we were talking about how much we would LOVE to have some volunteers around to help up transport patients, assist with exercises and perform other duties for us in the gym. These facilities would love to have YOU there because you would be helping to improve the productivity of the clinicians in the facility, which allows the clinicians to focus more time on the patient care and also helps the facility's bottom line. Do you have any inpatient experience? Have you had any trouble or success with finding these experiences? Let me know in the comments below! The holidays are right around the corner and many of us will be enjoying the food, family and friends that come with this time of year. Some students may feel that they have some extra time during this part of the year and they might be wondering how they can prepare for their upcoming applications. *(Cue the groans)* Okay hear me out! I know this is probably the last thing that you want to think about during your break, but this is a fairly manageable, yet significant task to complete if you plan this right. I would recommend buying a test prep book (or borrowing a used one that has unmarked practice tests) and set a goal to complete one chapter per day. I used Princeton Review and I spent maybe 1-2 hours on average per day just reading through the chapter and completing the practice problems. After you complete the chapters, then you should take each practice test under REAL testing conditions (this means timing each section and taking the test without distractions). In addition, you should download a GRE vocab app (there are several) for your smart phone. Whenever you have down time, you can just pull up the app and start going through flashcards. Persistence is key since this is all about memorization, therefore the earlier you can start--the better. You can schedule to take the GRE on most days of the year so you can schedule to take the GRE on the last day before the break ends and then be done with it. What many people may not realize is that patients in inpatient facilities (SNFs, rehab hospitals and hospice care) still need physical therapy on holidays. Ask these facilities if they'd be willing to allow you to volunteer throughout the holidays. This can be especially helpful for the facility considering that many therapists will be wanting to take off time for the holidays or extended vacation plans so the remaining staff could really use any extra set of hands available. If you're able to shadow for four hours per day, five days per week for two weeks, you can easily acquire 40 hours in a short period of time. This amount of time equates to a full work week, which DPT programs often view as a significant amount of time for a given setting. This is obvious and I'm sure many will elect to do this anyways, but I really would like to encourage students to get back to the things they love doing that maybe they didn't have time to do while in school. Also, take some time to reflect on the previous term. Did you grades turn out the way you had hoped? What adjustments may you need to make before going into the next term? Do you need to set a weekly schedule, seek out tutoring or reevaluate your other commitments? Your grades are important, so careful planning is the key to building a strong application. What else are you looking forward during these holidays? Let us know in the comments! Is my grade in that class going to be a deal-breaker? If you’re applying in this cycle, it’s important to recognize what you can and cannot change. Focus on the parts of the application that you can still change: pending classes, pending standardized tests and the personal statement. By focusing on these items, you can avoid stressing yourself out and commit your best effort to these crucial parts of your application. Even if their numbers are very high or very low, their numbers represent one data point that contribute to the class’s average statistics. Yes, pay attention to the averages, but don’t let your perception of your candidacy be shaped by the statistics of one or two accepted students. While your path to becoming a healthcare professional may take longer than others, don’t quit. Everyone will face challenges at some point along their academic and professional journey. The key is to persevere through adversity by remembering why you’re on this path. Why do you want to become a healthcare professional? Was there a certain patient whose life was changed by receiving care? Was there a certain healthcare professional who modeled for you the qualities of an excellent clinician? Regardless of what drives you, keep these thoughts fresh in your mind, not only to help you with your personal statement, but to remind yourself that the path is undoubtedly worth the challenge. Where Should I Apply for Physical Therapy School? With the physical therapy application slated to open up on June 30th, many applicants are compiling their application materials and figuring out how they are going to answer the 2016-2017 PTCAS personal statement prompt. Beyond preparing for the admissions process, applicants should also carefully reflect upon the list of schools they plan on applying to. Remember that your primary goal as a future student physical therapist is to pass the National Physical Therapy Exam (NPTE) to acquire your license. Schools are mandated to publish statistics for prospective students such as their PT licensure exam pass rate and 6-month post-graduation employment rate. These statistics should easily be in the 90+% range, and you can use these numbers to determine how well the program will prepare you to pass the licensure exam. Are you interested in aspects of the physical therapy profession that are not purely clinical? Maybe you want to explore research, become a future clinical instructor, or open your own private practice. Maybe you are determined to work in a particular physical therapy setting in the future, such as sports physical therapy or neurological physical therapy. Does the program offer any additional training or education to cater to these specialized interests? While every DPT program must prepare their students to pass the NPTE, prospective students can use these elective paths to decide which programs align with their interests and future goals. The job market for physical therapists is strong, with employment expected to grow by 34% in ten years. While this is great news for students, we cannot expect to acquire our dream jobs immediately as new grads by simply handing out resumes. Contrary to popular belief, many jobs as a new grad are acquired through a student’s professional network, through the people they have met and worked with. This means that it will be increasingly important to choose a program with a broad range of clinical affiliations for your rotations, where you will be able to build a strong network with the professionals you meet. Be sure to ask DPT programs about their options for clinical affiliations. Even better, ask the program if you can see the list of clinical affiliations. These affiliations represent opportunities for you to secure a job upon graduation, and you want to know that you’ll have options that interest you. These are a few criteria that you should reflect upon when deciding where to apply. Overall, every program must prepare its students to pass the boards, so some may argue that the school doesn’t matter. However, the DPT program’s educational philosophy and network will influence your growth and career trajectory as a future professional. Therefore, you should critically consider the above criteria when selecting your list of DPT programs to apply to.